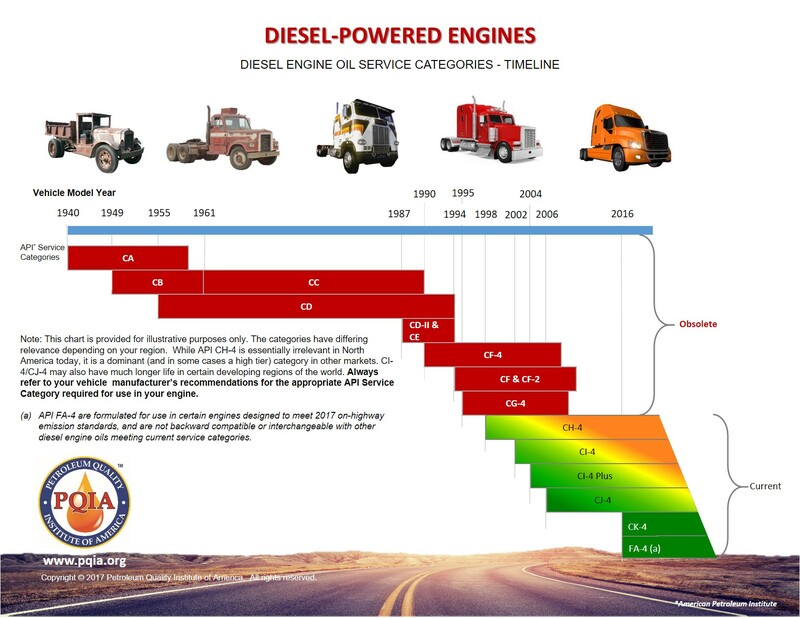 In addition to the “Caring for Your Car – Engine Oil Timeline,” PQIA developed to help educate consumers about the American Petroleum Institute (API) Service Categories for passenger car motor oils, we now have a similar, and simple timeline designed to help educate consumers about the Service Categories for diesel engine oils. The results of the tests conducted on samples of the brands below meet the SAE J300 specifications for the SAE Viscosity Grade listed on the product label, and are consistent with the listed API Service Categories. It should be noted, however, that the Formula 300 API SL is formulated for use in 2004 and older gasoline-powered automotive engines, and the PolyGuard API SM is formulated for use in 2010 and older gasoline-powered automotive engines. Furthermore, the PolyGuard API SM and the Formula 300 API SL products do not display the API certification mark (donut) showing that it is an API licensed product. As such, they are not subject to quality testing conducted by the API’s Aftermarket Audit Program (AMAP). This is a reminder to always read the front and back labels of the product you purchased to assure it meets the requirements for your vehicle (as shown in the owner’s manual).